This material does not deal with rugs, but with their adjunct -- that is, the structure within which they were sometimes made, and always used. These little buildings have a long history, noted by western travellers fairly early on, typically described as round houses sometimes transported on carts. 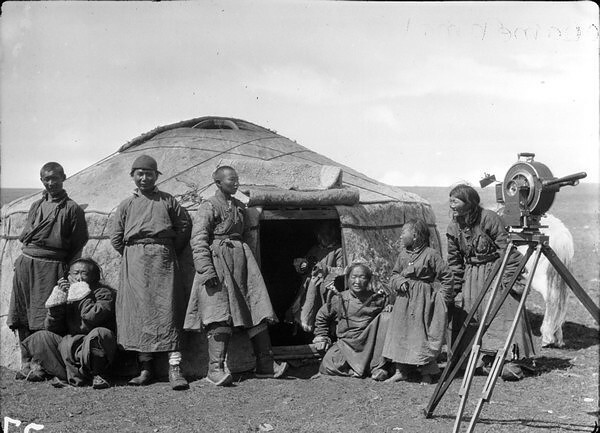 What apparently is the first yurt color photograph was taken in Merv by Prokudin-Gorsky c. 1914. 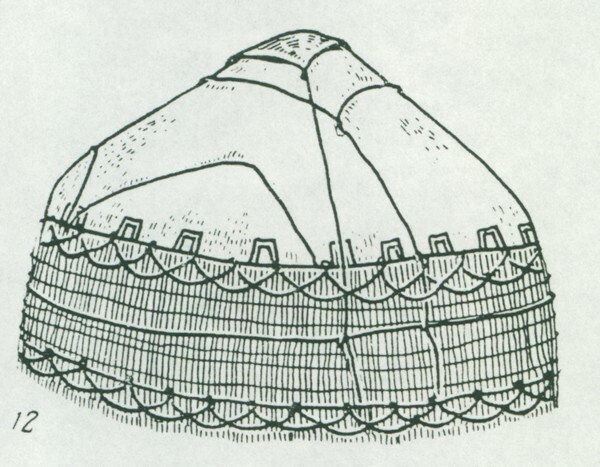 There is an argument that the yurt is one of the world’s principal architectural inventions. 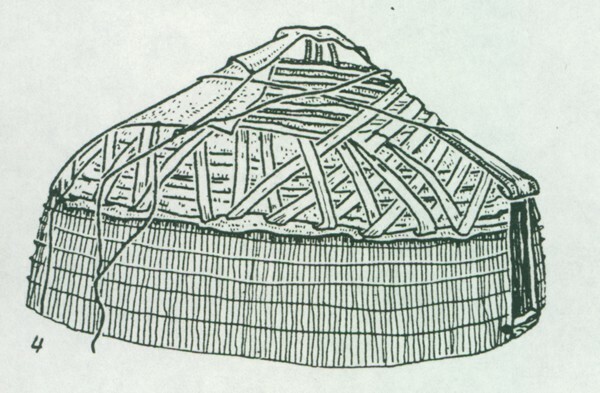 Literally the word yurt refers not to a structure but rather to the ground on which it stands. Some correct terms are – depending on tongue and transliteration -- iiy, oy, uy, topak-ev, (Turkish, round house), xane/xana (Persian). 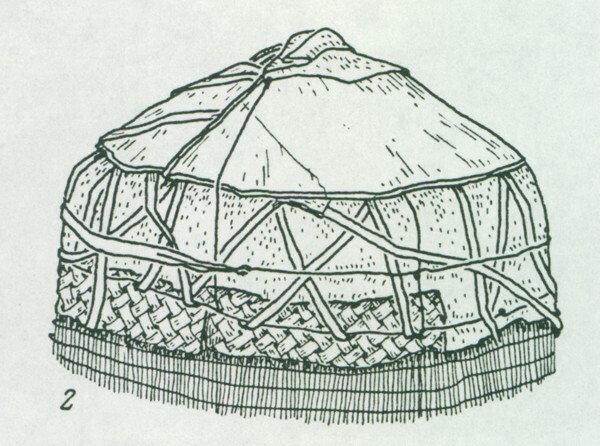 Since outsiders regularly wrong-foot words of cultures they do not understand, nowadays it is yurt -- sometimes dedicated to other activity such as weaving or cooking. 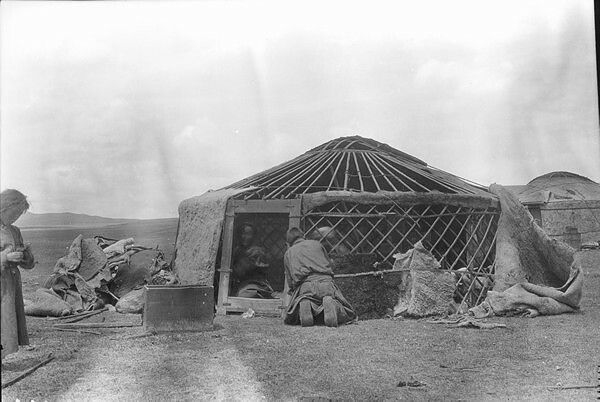 There is a view among those who study such matters that there are two basic forms, rounded roof (Turkic) and pointed roof (Mongol), the former, with “bent poles”, the latter, with “straight line poles”, for roof support. 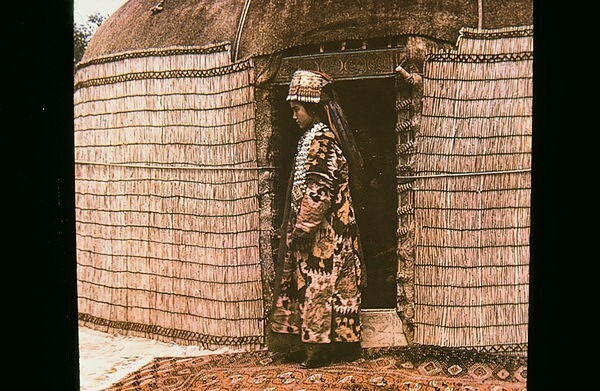 A photo of two side by side yurts of each type shows up in a routine early 20th c. travelogue about Kazakstan. 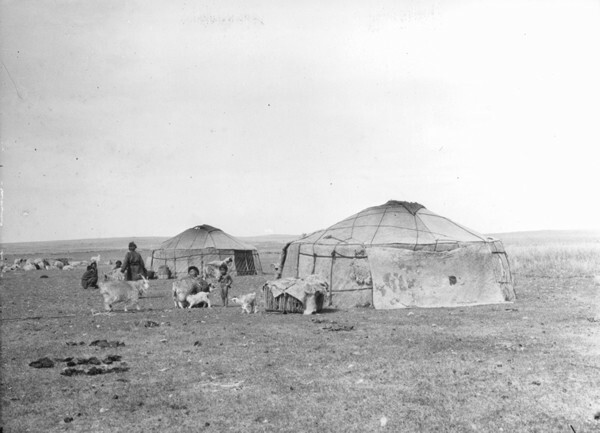 The photo below of the Turkish type was taken in Mongolia. Type thus may not say much about location or who is inside. 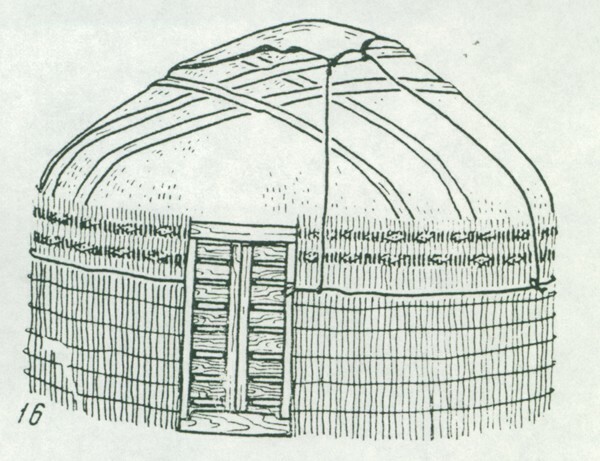 Yurts vary in a number of ways; some can be rather grand; others, exceedingly modest. 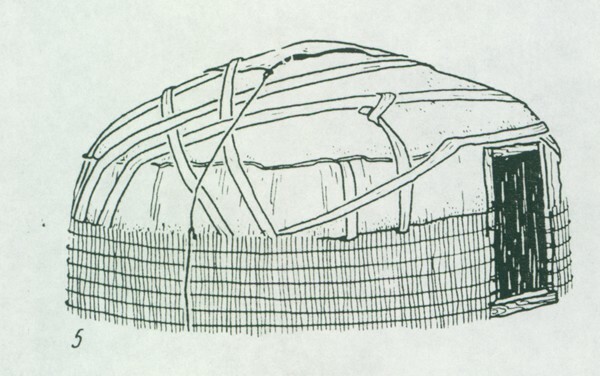 On average, for typical dwellings, the wooden lattice structural supports weighed 220 to 331 lbs., the felt cover, 220. 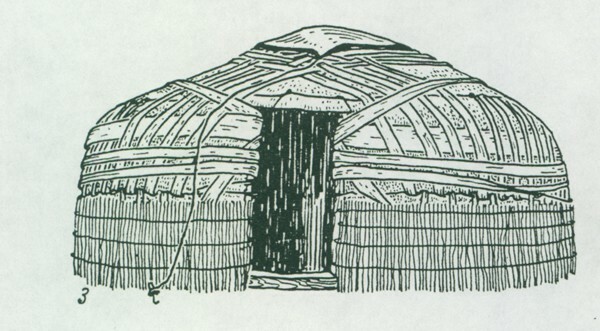 Given a somewhat standard size for ordinary folks’ domiciles the diameter tends to be more or less the same, thus Turkmen tent bands typically are in the upper 40’ range. 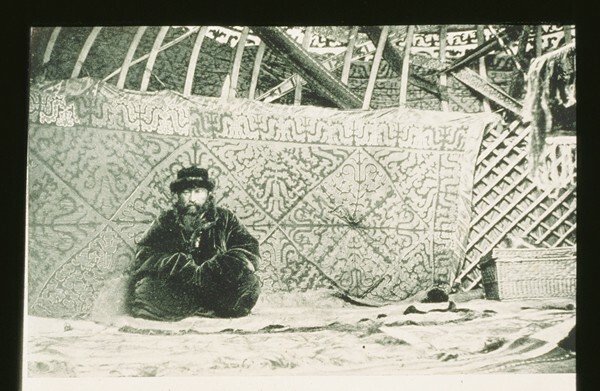 One rug, a hearth surround, is peculiar to the yurt. 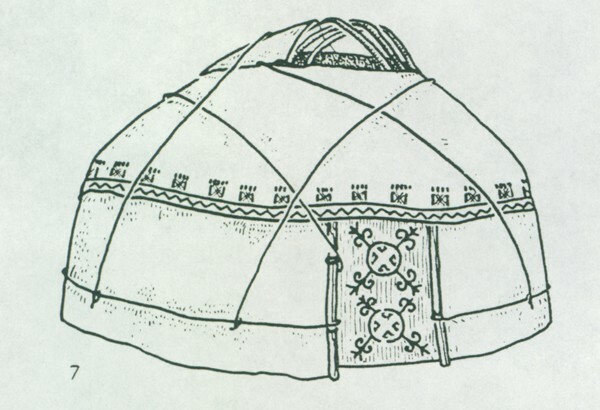 Altaic Turk yurts of high eastern Asia looked like the teepees of native Americans, quite conical; and as with the Americans some have hide coverings, others, birch bark. 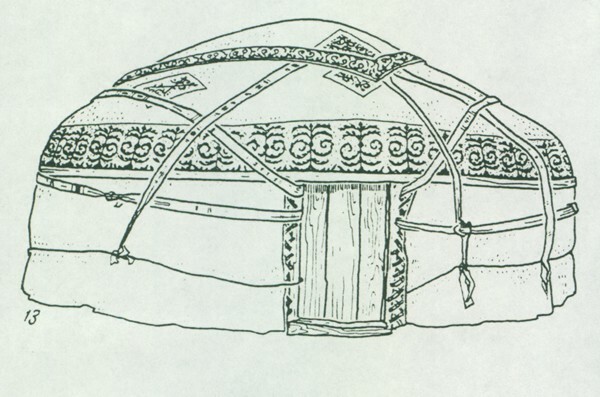 The Karakalpak yurt resembles the Kirgiz; the Turkmen is more attractive than the Kirgiz due to the presence of more white (felts) and being “richer in furnishings”; otherwise it is a “repetition” of the Kirgiz. 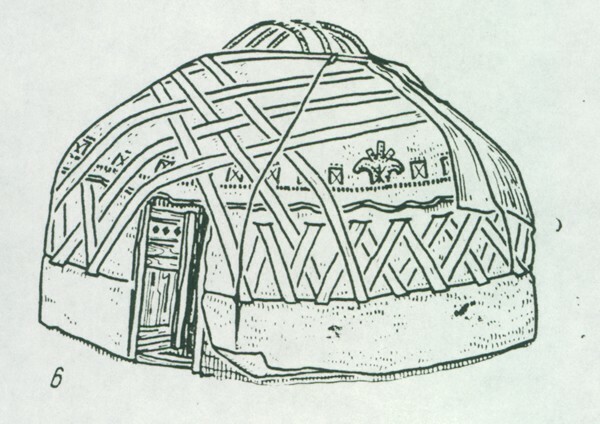 Yet some non-Turkmen dwellings seemingly were rather well furnished, viz, a likely Khirgiz interior. 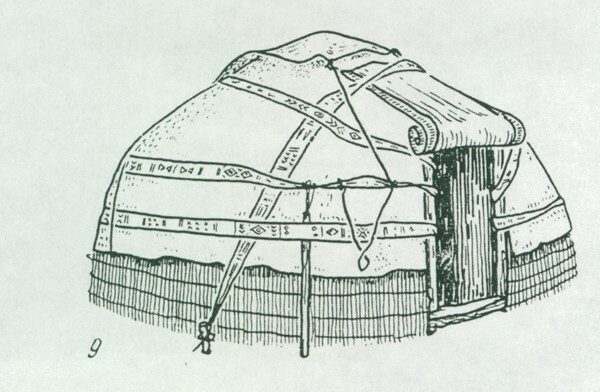 Bulk felt is the work horse cover in central and western Asia – yurts, floors, even carts -- as in old Bukhara. Pictures convey information much better than do words and can be taken in at a glance. . 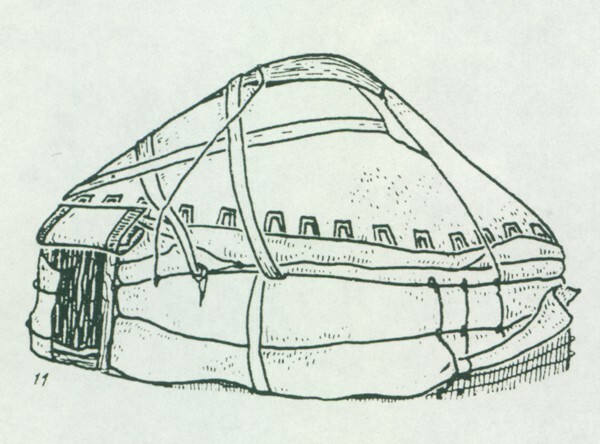 Appendix A contains a number of drawings of yurts of various groups. There is need always for caution with respect to artists’ illustrations. A number of factors – indifference, carelessness, creativity – can get in the way of accuracy. 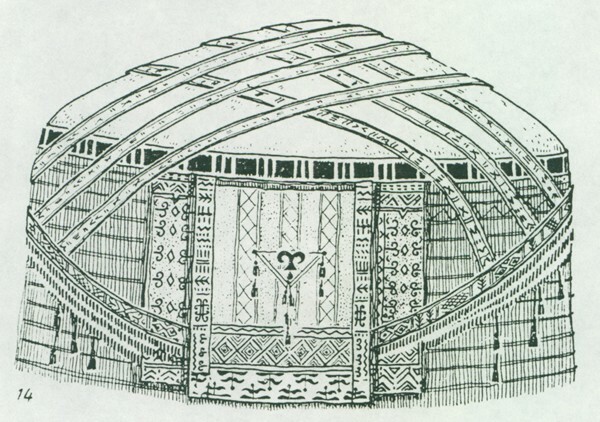 The drawings in Appendix A, however, attempted to be accurate: “Yurt types are according to the literature and field [work] materials.” Indeed, one can see a door closing apparently of patterned felt, a roof flap dropped down, fabric, wood, perhaps a rug, and wattle wall surrounds of various types. 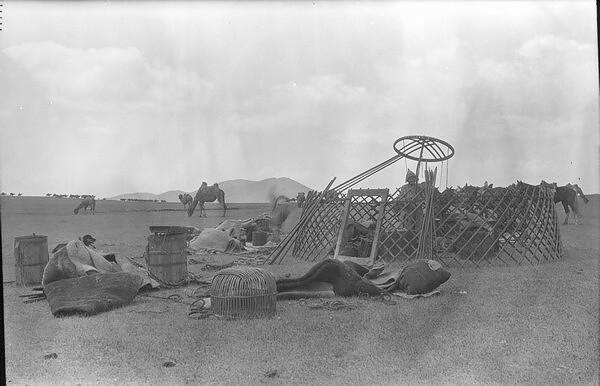 Appendix B shows photos of a yurt being set up in Mongolia, probably in the 1920’s. 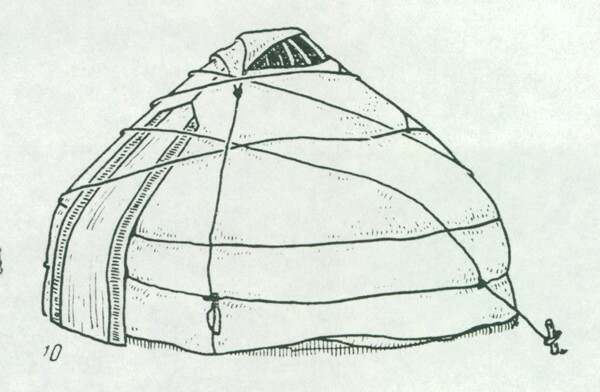 Appendix B is accurate and illustrates that many yurts were not gussied up. The Curious and Remarkable Voyages and Travels of Marco Polo, in Pinkerton’s Voyages, Vol VII, 1811, taken “chiefly” from Ramusio. Le Brun, Corneille, Voyage au Levant, Vol. 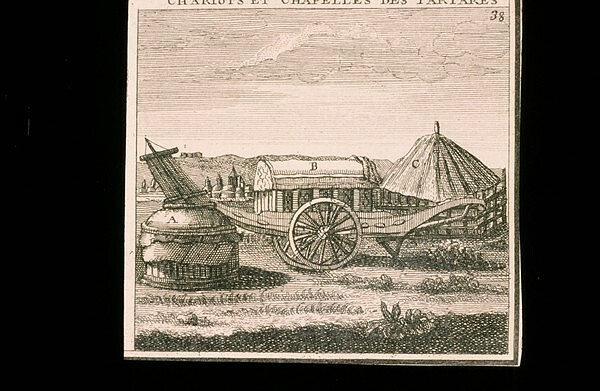 II, 1726, p. 303/304. 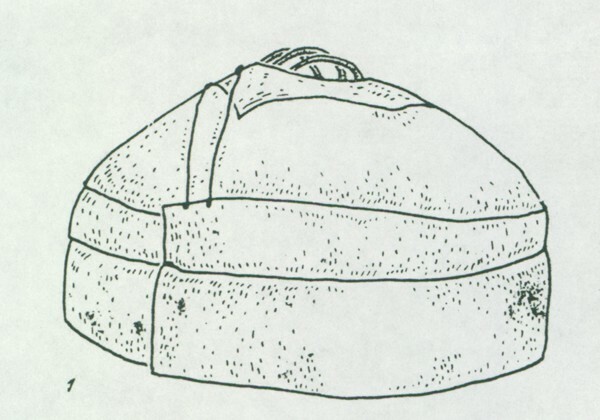 Rapport Final, Seminaire sur le nomadisme en Asie central (Afghanistan, Iran, URSS), Commission Nationale Suisse Pour l’UNESCO, 1977, p. 84. Karutz, R., Unter Kirgizen und Turkmen, translated from the Russian, 1917. Courtesy Dept. 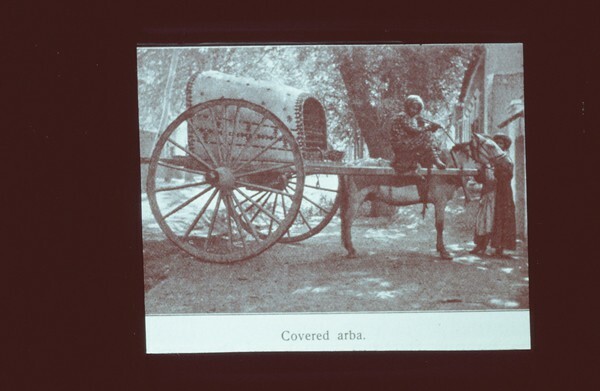 of Library Services, American Museum of Natural History, Neg. No 251259, J.B.S. Rapport Finale, op. cit., pp. 84-85. 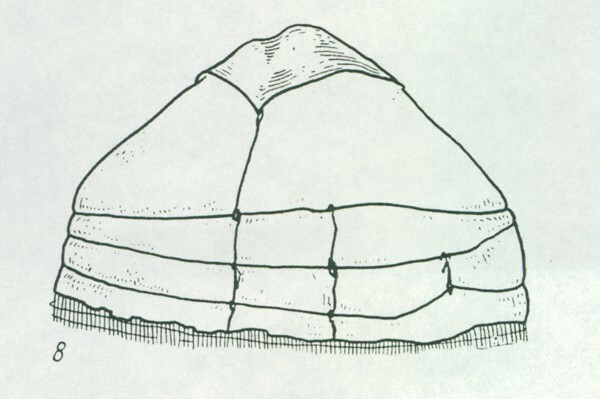 Kharuzin, N., Istoriya razvitiya zhilishcha …, pp. 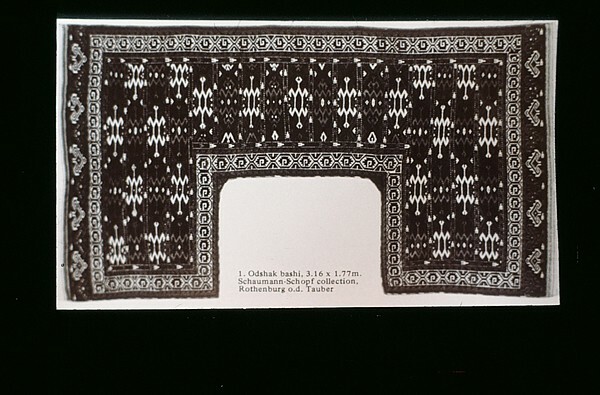 6-7, 1896. Ibid., p. 36, p. 38. 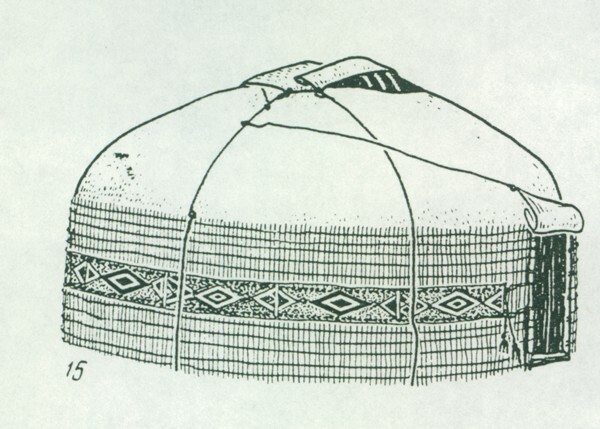 Borozna, N. G., Material’naya kul’tura uzbekov babataga i doliny kafirnigana, Material’naya kul’tura narodov Srednei Azii i Kazakhstana, pp.98-99, 1966. American Museum of Natural History, op. cit., Negs No. 251266 & 67, R. C. Andrews; Neg. No. 251258.